Having a moon for a head at high school is a pretty tricky situation. But when the school talent contest is announced, Joey Moonhead spots an opportunity to impress his classmates with a music machine. An imaginative and visually poetic take on the stock American high school drama, this is one graphic novel that's out of this world! Andrew Rae is well established as an illustrator capable of rendering just about any scenario, either real or imagined. From images of animals and monsters through to scenes that include hoards of people. Andrew's well-observed and witty approach has led to a wide range of commissions, both editorial and commercial and he has exhibited his work internationally. He has illustrated the art history books This is Dali and This Warhol published by Laurence King and has written and illustrated the graphic novel Moonhead and the Music Machine published by Nobrow. Based in London, he is a member of the highly regarded Peepshow collective and also the Association of Illustrators. 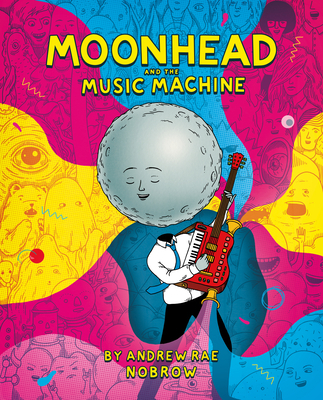 "But for all its musicality, "Moonhead" is a beautifully quiet book, with Rae's measured, clean design creating seamless pantomime sequences. Despite the tensions between our odd-domed hero and the sadistic rich kids […], Moonhead has a sense of serenity that adds an elegant sheen to a familiar story"
"The story itself is familiar, but the true glory of this graphic novel lies in the spectacular illustrations. Multi-page spreads invite lingering, and readers will be rewarded for careful examination of illustrations as there are clever details hidden in most (Joey’s fantasy hookup, for instance, is a marvel of fertile imagination featuring breast mountains, too-graphic-for-O’Keeffe flowers, and copulating bunnies). The exquisite color choices and format decisions highlight Rae’s impeccable eye for illustrative work. Joey’s story may be standard material, but the visual rendering of it is truly something exceptional. "A book illustrator by trade, Rae clearly labored over these pages, and it is extremely visually captivating." "The saturated, full-color panels make great use of psychedelic colors to telegraph the awesome power music has not only on Moonhead but also on his peers, who transform into weird but friendly shapes after listening to his music machine. A colorful, offbeat take on being a winning oddball teen." "A humorous coming-of-age story that doesn't take itself too seriously, the graphic novel relishes in its most surreal moments…while still feeling relatable to anyone who's ever felt like the underdog." "This is one of those pinkwaterian stories about alienated, weird, creative freaks coming of age in schools that are not nearly so soul-destroying as they believe them to be that I just love. It's a great chapter for a happy mutant bible, with lots of nuance and ambiguity that makes it more than just a tale of Breakfast Club estrangement. Rae makes great use of the surreal touches here, never quite treating the moonhead (and the mutated students) as pure literary devices, nor making them quite literal either. The visual humor and ambiguity are just delightful." "I don’t want to spoil anything, but there is absolute brilliance in this story: How Moonhead comes to understand his relationship with ghost boy, how his music changes many of the other students, how that impact is shown visually, and how Moonhead deals with his new-found popularity. But most amazing is that this graphic novel shows how effective visual art is at telling stories about sound, about music, and about how important music is to our lives, particularly when we are teenagers, dealing with the stress of coming of age." "Joey Moonhead’s deadpan acceptance and difficulty at having a hovering moon for a head takes narrative directions that are not only amusing but leave you pausing, just considering the spectacle of it and conceiving of what that kind of life would be like." "While the plot may seem expected, the illustrations by Andrew Rae are anything but." "[…] it’s a clever re-envisioning of the traditional high school drama/coming of age story. […] From the opening big bang to the ending jam party with Joey and friends, Rae makes palette choices that are bright and uplifting, and the most engaging pages are those where he just lets his imagination run wild designing intricate psychedelic landscapes and page after page of album covers." The ligne claire style of drawing combined with a soft pastel palette gives each page a gently psychedelic quality. […] Bubbling under the surface of a mostly mellow story is the idea that art can be so powerful that it can cause those exposed to it to examine their true selves and find some raw, ugly truths. "A strange, beautiful book about a boy with a moon for a head, either metaphorically or literally, it really doesn’t matter) and his high school experiences of making music. Rae’s funny, colorful book belies the complex inner journey of Joey Moonhead as he learns about life." "The beautiful layout coupled with animated frames and bursts of color will undoubtedly engage adolescent readers."